SANTA BARBARA — Shearwater, a 62-foot research vessel moored in Santa Barbara Harbor, will continue its extended stay, if the Santa Barbara City Council approves the Harbor Commission’s recommendation to authorize a five-year lease agreement with the National Oceanic and Atmospheric Administration (NOAA). The vessel has been docked at the harbor’s 4-B end-tie since 2008. The new lease would extend the boat’s stay, with an increase in the monthly slip fee from the current $1,500 to $2,000 per month, plus utilities. In an effort to keep a presence in the area, NOAA leased 452 square feet of office and storage space in Santa Barbara Harbor in 2013, after NOAA relocated the majority of the local Channel Islands National Marine Sanctuary headquarters to a new building at the University of California, Santa Barbara campus. 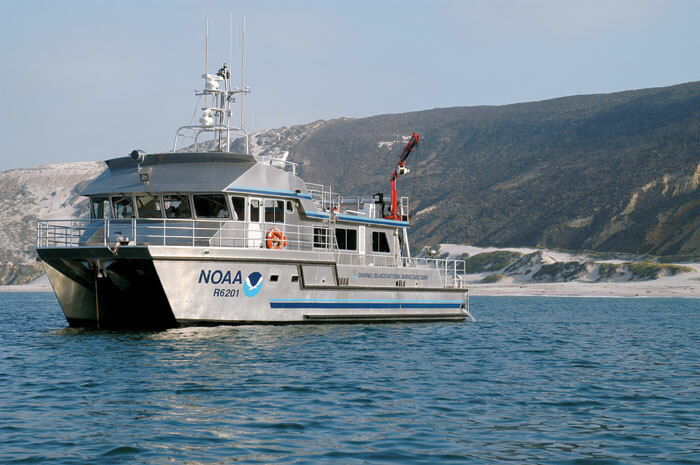 “We are pleased with our homeport of Santa Barbara, although we also use Ventura Harbor, Channel Islands Harbor and Port Hueneme,” said Chris Mobley, superintendent of Channel Islands National Marine Sanctuary. “Santa Barbara Harbor built a slip custom- designed to accommodate our vessel. It is closest to our offices at UCSB, has great dockside services and optimizes our access to all of the northern Channel Islands — including Santa Rosa and San Miguel. In 2008, the Santa Barbara Waterfront Department built out the lease space to accommodate three vessels instead of one, with the intent to lease a slip to Shearwater. NOAA contributed $10,000 in advance to assist the department with design and engineering costs. The specifications of the vessel were taken into account during that process, according to staff reports. The three 28-foot-wide Mediterranean mooring-style berths accommodate vessels up to 80 feet in length. Tenants are billed monthly for their electrical consumption, in addition to lease fees. Shearwater — a high-speed Teknicraft aluminum-hull catamaran — was christened by the Channel Islands National Marine Sanctuary and NOAA on May 12, 2003. The education and research vessel has served the fleet since that time.